Can Sit Ups Cause Severe Pain in the Stomach? Sit ups are an effective exercise to strengthen and tone your abdominal muscles, but the stress they put on your muscles and digestive system can cause pain. Severe pain can indicate issues including cramps, a strained muscle, and problems with your stomach and intestines. In some cases, self-care measures can remedy the pain, but if the pain is particularly severe or does not get better after one to two days, seek medical attention. If you overexert yourself while performing sit ups, it can cause a slight tear to the muscles, known as abdominal strain. Muscle fatigue may also cause your abdominal muscles to contract involuntarily and with great force, resulting in a cramp. Cramps can also be caused by dehydration, electrolyte imbalances and not warming up and stretching before performing sit ups. Eating too much before doing sit ups or consuming foods or substances that irritate your intestinal tract or are hard to digest can also cause severe pain. In some cases, sit ups can exacerbate an underlying gastrointestinal problem, such as an ulcer. A severe abdominal strain is marked by pain upon the initial tear that turns to discomfort or mild pain afterward. You might also feel stiffness, increased pain upon movement, pain upon palpation of the area and in severe cases, swelling and bruising. A severe muscle cramp is typically a sharp, stabbing pain that lasts for several seconds, although it can last for minutes in some cases. Severe cramps can leave your muscles feeling sore and tender. The pain from digestive issues is often colicky, meaning it comes and goes. In addition to pain, you might also experience gas, bloating, belching, nausea, indigestion, diarrhea or vomiting. If you suspect an abdominal strain, contact your doctor to verify the diagnosis. In the meantime, strains can be treated by rest and applying ice the affected area for 15 to 20 minutes every three to four hours. 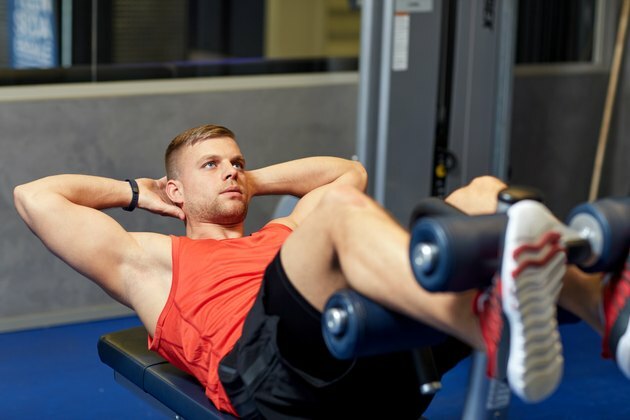 Muscle cramps usually go away on their own, but grabbing the affected muscle and massaging it while stretching your abdominal muscles can help get rid of more severe cramps. Severe pain resulting from digestive issues is often caused by a buildup of gas, so having a bowel movement may offer relief. Massaging your stomach may help as well. If the pain does not get better after self-care measures, consult your doctor. Seek immediate medical attention if the pain is particularly severe or is accompanied by fever, blood in the stool, shortness of breath or severe fatigue. Take steps before and after sit ups to prevent severe pain. Warm up before doing sit ups, and gently stretch your muscles after your warm up and after the sit ups. Avoid pushing yourself to the point of muscle fatigue, and consult a certified trainer who can teach you proper form. Eat a full meal no fewer than two hours before you do sit ups, and avoid consuming problem foods or substances, including caffeine, high doses of vitamin C, alcohol, carbonated beverages, and foods with a lot of sugar, fiber or fat. You might have to experiment by removing other foods or substances as well. Make sure you are getting enough electrolytes in your diet by consuming plenty of nutrient-rich foods.